Police are hunting a gang of teenagers after a man was attacked in his car then chased down a street. 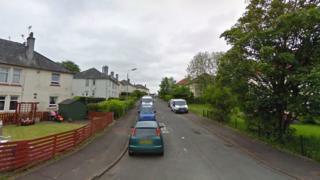 The 32-year-old victim was in his white Audi on Hill Avenue, Newton Mearns, when one of the suspects opened the passenger door. Police said the man was seriously assaulted at about 02:20 on Saturday, which caused him to hit the accelerator pedal and crash into a parked car. He then ran for help but was pursued by his attacker and three other suspects. The man was then assaulted for a second time. The teenagers fled the scene when a motorist stopped to assist the injured man. He was taken to the Queen Elizabeth University Hospital in Glasgow where he is receiving treatment. Police said the suspects were male, white and aged between 16 and 18. Three were wearing dark hooded tracksuits and one was wearing a grey hooded top and dark tracksuit trousers. The crime is being investigated as an assault with intent to rob. Det Con Joseph Keith said: "The motive for this attack is unknown and a man has sustained serious injuries. "I appreciate the incident occurred in the early hours of the morning but it's possible someone saw or heard something. "Perhaps someone saw the four men hanging around Hill Avenue and thought nothing of it at the time, however, in light of this crime, any information could prove vital and I would urge people to get in touch with us."